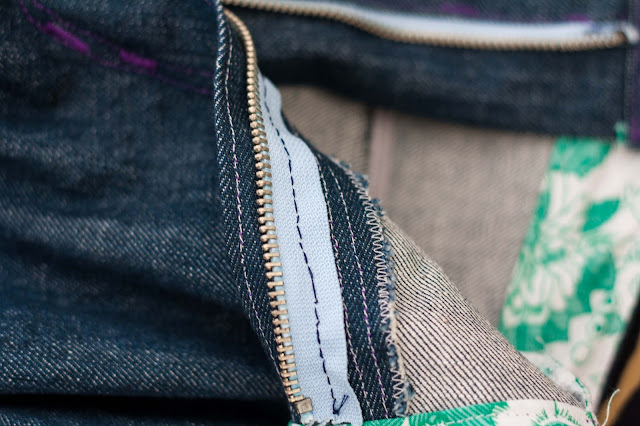 the engineer's other life: Jalie jeans - or "how I replaced the broken zipper of doom"
Jalie jeans - or "how I replaced the broken zipper of doom"
As you can imagine, I wanted to set these jeans on fire after the Great Zipper Disaster of 2013. That was NOT FUN. No serger, but this works for me! But that would have wasted the time and materials I'd already put into them. If I'm honest, it would be around 20 hours of sewing time (I'm slow). Plus 1.8m of designer denim, 4 rivets, one button, 150m of regular thread, about 50m of topstitching thread, and a BLOODY ZIPPER. (actually, that zipper was a waste no matter what). New Jalie 2908 jeans are worth using quality hardware! 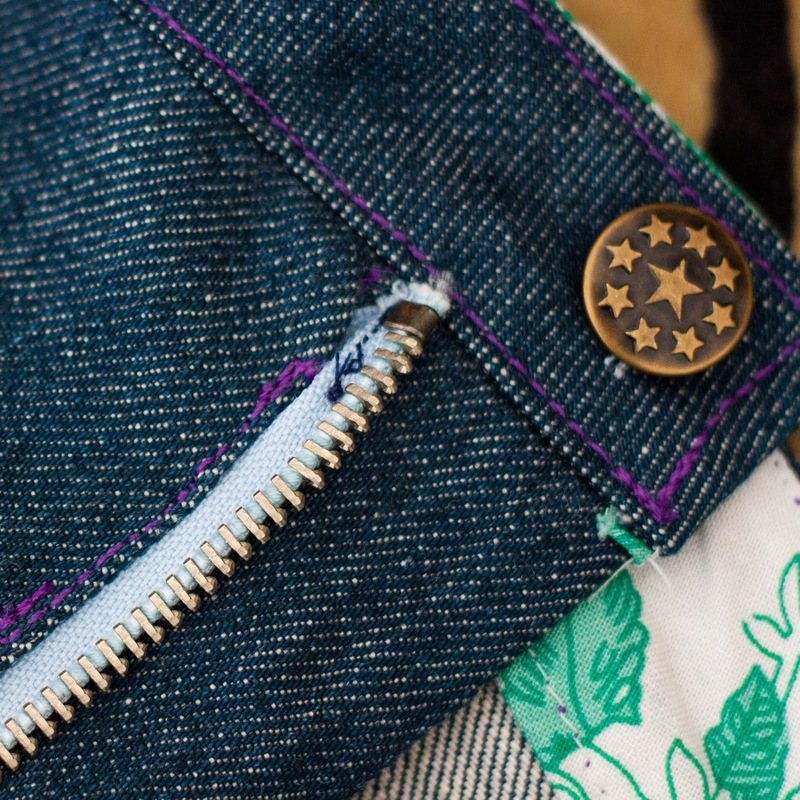 So I sucked it up, and found a couple of tutorials I liked for replacing broken jeans zippers. I ended up using the Threads one, because I decided against a button fly. Overlap side - super awesome hand backstitches. Well, they'll do the job. "Making it work" - the top kept poking out because it wasn't sewn into the waistband. It wasn't so bad. I bodged it a bit to "make it work". 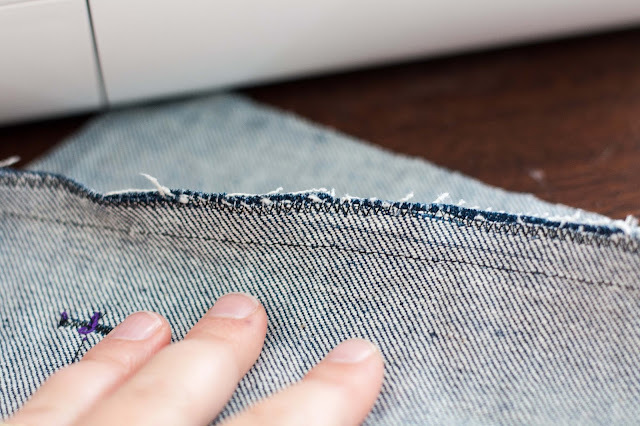 I'm not sure if my hand sewing is as strong as the machine sewing. If I come home from work tomorrow with my pants around my ankles, we'll have our answer. Anyway, I think we can now call this a modest success. 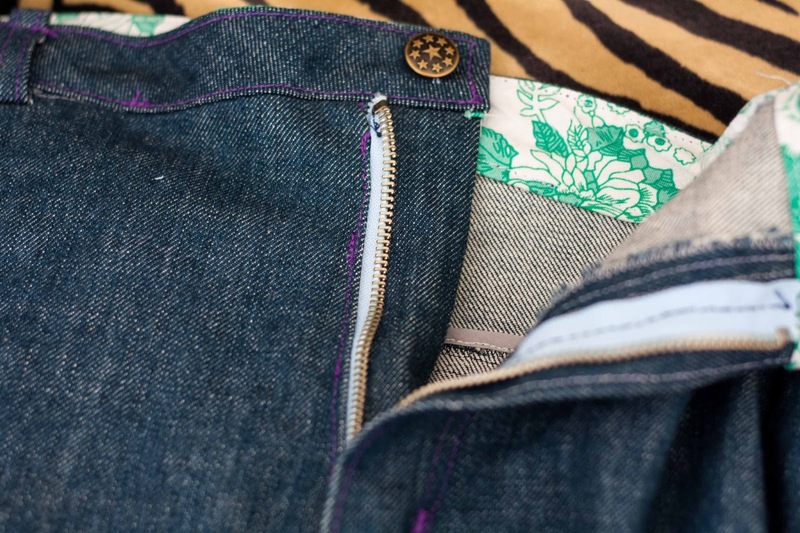 The jeans fit as well as any I've ever had, and next time I'll have a go at removing the gaposis. The only change I've made is that I made the pattern two sizes bigger than last time... because I realised that the denim I'm using is nowhere near 20% stretch. It's more like 5-10%, which means it essentially behaves as a non-stretch but is less likely to burst open at the thighs! They look fantastic! I'm glad you were able to rescue them after all. Thank you! I'm happy too. I'm glad too! I was going to do *more* stars, but ran out of enthusiasm. I think the two are enough, though. Wow, these look seriously amazing. This fit is great! I must try this pattern! I'm so glad that there was an easy(ish) fix! Gives me hope for rescuing (for example) op-shop clothes that have busted zips too - perhaps more stuff is fixable than I realised! Glad you managed to fix them - great fit - looks good. The zip on my Jalie jeans just broke. I've worn them for 8 months already, so not as bad as yours, but still I'm sad. Thanks for the links on how to fix it quickly.